Automotive Air Conditioning & Refrigeration Parts. We are occupied in delivering an extensive range of Automobile Air Conditioning Oil Seal. Our provided range is available in varied specifications that meet on client’s demand. Eta Star Appliances Pvt. 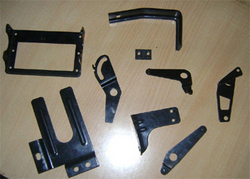 Ltd.
We manufacture precision designed and molded range of Automobile AC Parts, which find application in automobile AC's. With the help of our modern production facilities and services of experienced industry professionals, we are capable of delivering these in exact specifications as demanded by the clients.